Kris Kobach's campaign is eager to remind voters that he's conservative. On the campaign trail, he offers another term that underlines the ambitious Republican secretary of state’s approach to politics and to governing. He promises to be a “full-throttle” conservative. Indeed, if his politics are conservative, his approach to public life is aggressive. He pledges a hard line against abortion, on immigration, for lower taxes. And he promises to fashion a Kobach administration in Kansas the way President Donald Trump has remade politics in Washington. “Oh, I know, some liberals listening are just — it’s getting under their skin already,” he says. He enjoys confrontation, all the better to shake things up. His critics say that willingness to engage in battle both reveals a malicious streak and tends to mask racist overtones and a tendency to ignore facts when they conflict with his narrative: like his claims of widespread voter fraud. 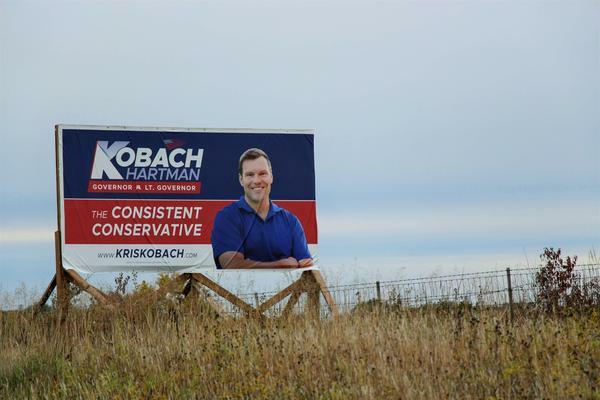 From his failed race for Congress a decade ago, through two successful runs for secretary of state and on in this year’s bid to become governor, Kobach continues an unflinching approach to politics. He’s made a career out of his tough stance on immigration, contending, despite evidence to the contrary, that those who come to the country illegally steal the jobs of native-born Americans and pose a threat to democracy by voting illegally. Polls suggest he’s among the most divisive candidates to seek high office in Kansas. Yet, with a loyal base of supporters similar to Trump’s, he’s locked in a tight race with Democrat Laura Kelly to be the state’s next governor. Political scientists say Greg Orman’s independent candidacy could enable Kobach slip into office with less than a majority of the vote. The production team includes Beth Golay, Nadya Faulx, Scott Canon, and Grace Lotz. Primary Color Music composed our theme. Reporter Celia Llopis-Jepsen contributed to this report.